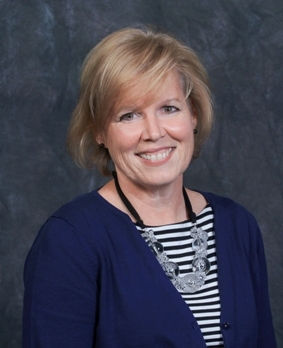 Before leaving for his new job at Temple University, University Librarian Joe Lucia announced Joanne Quinn’s promotion to team leader for the Communication and Service Promotion team (formerly the Communication and Publications team). Quinn had served as interim team leader, after Judith (Judy) Olsen retired, from February 1 to April 15 of this year. In fall 2011 Quinn was promoted to the newly created position of design specialist. In that position she is the primary graphic designer for library publications, web graphics and marketing materials. She continues to design and mount cultural and collection oriented library displays. Quinn is also the Falvey whiteboard artist, creating timely images each day that she is on campus. In addition, she is a member of the University’s Social Media task force, the Scholarly Outreach team and Falvey’s University Staff Council (USC) team. Quinn also works with the Digital Library, creating graphics for their exhibits and conferences. Quinn came to Falvey as a reserve technician in Access Services and then became an interlibrary loan specialist before her promotion to graphic designer. She began graphic-design work for the Library while working with interlibrary loans. Quinn received a bachelor’s degree in Communication in 1984, a Certificate of Graduate Study in Advertising and Media Production in 2012, and is currently completing her master’s degree in Communication, all from Villanova University. Her hobbies are music, traveling and haunting her public library for reading material. She is a dedicated Phillies fan.